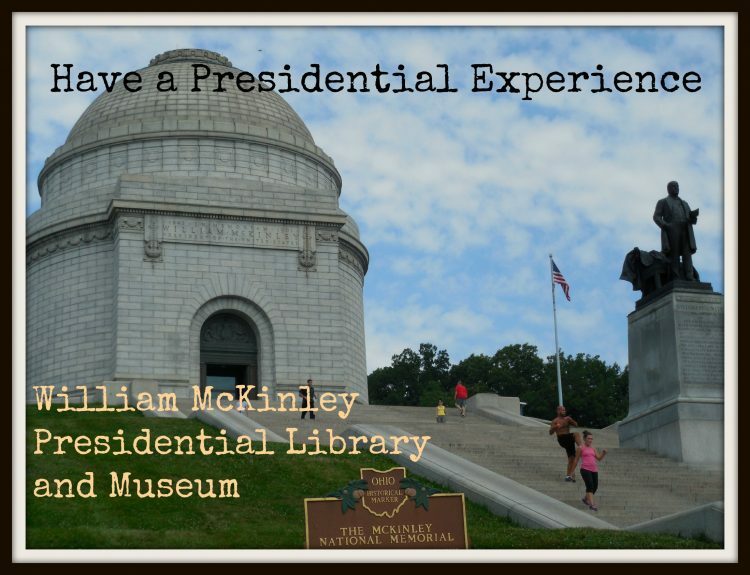 The McKinley Museum is located right across the street from the William McKinley Tomb. I’ve mentioned in a couple of previous posts that my brother and I were homeschooled growing up. We didn’t have a ton of money to spend when it came to field trips, so we stayed pretty close to home. 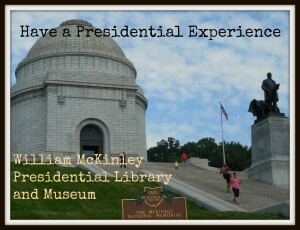 One of my favorite places to visit was the William McKinley Presidential Library and Museum, located in Canton, Ohio. 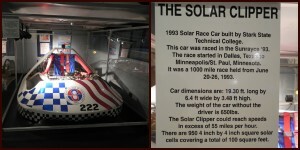 I personally believe that the McKinley Museum has something for everyone! 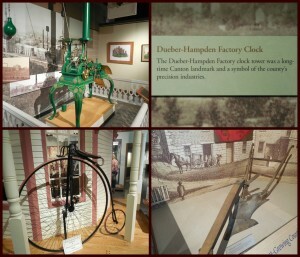 Top left: the museum’s sign. Top right: a bust of President McKinley. Bottom: A quote by President McKinley posted on one of the museum’s walls. Of course, a presidential museum should have presidential items. 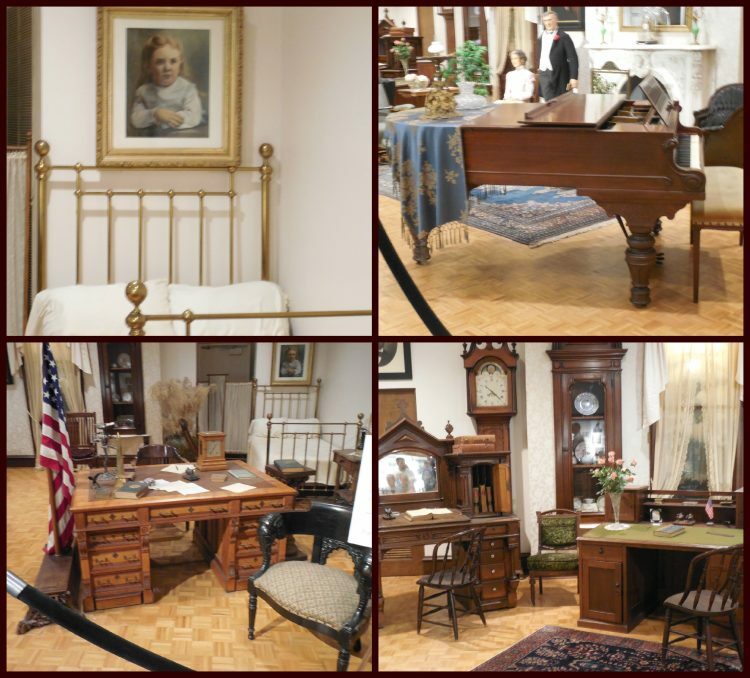 In the McKinley Gallery Collection room, a wide variety of memorabilia is housed, telling the story of President McKinley’s life. 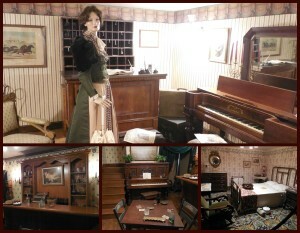 Photos, letters, personal items and furniture can be found in this section of the McKinley Museum. There are even life-sized, animated mannequins fashioned to look like William and Ida McKinley in the room that “interact” with visitors and welcome them into their home. 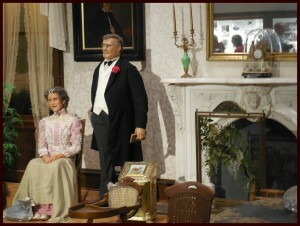 Mr. and Mrs. William McKinley, ready to welcome guests into their home. The McKinley Gallery at the McKinley Museum features the largest collection of William McKinley memorabilia in the world. 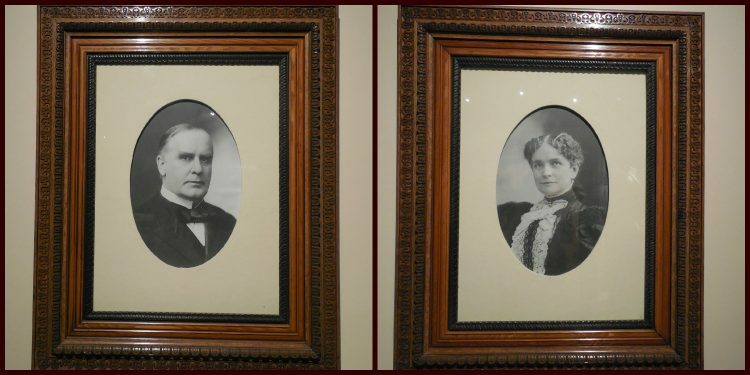 This gallery tells William McKinley’s life story, from his birth to his assassination. It is a great educational experience for children as well as adults. 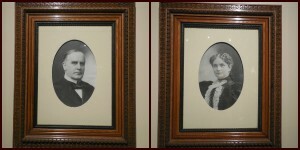 Portraits of Mr. and Mrs. McKinley. Some of the pieces featured in the McKinley Gallery Collection. Top left is a photo of the McKinleys’ daughter, who died when she was young. In 2014, the McKinley Museum achieved a significant, long-time goal. A diamond tiara that had belonged to Ida McKinley was sold to the Gold & Silver Pawn Shop, the site of History Channel’s “Pawn Stars.” The owner, Rick Harrison, agreed to sell the tiara to the McKinley Museum for his purchase price of $43,000. Generous donors lined up to help the museum purchase the tiara, and it is now on display in the McKinley Gallery Collection. It’s a sight to behold and definitely something you should be sure check out if you visit the McKinley Museum. Left: the Ida McKinley Tiara Fund. Center: Ida McKinley’s diamond tiara. Right: information on Ida McKinley’s tiara. The museum goes far beyond a “life and times of the 25th President of the United States,” though. 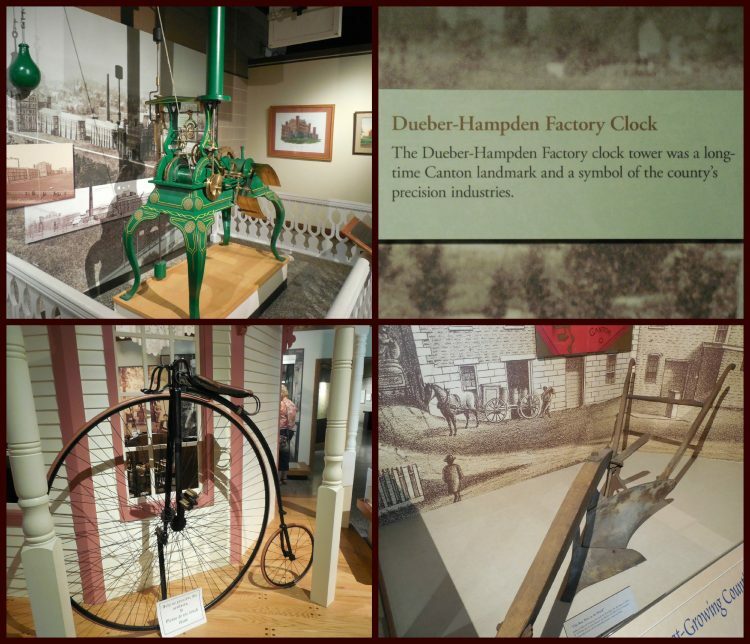 There’s so much more to this museum, making it a true gem! Some fun features at Natural History Island include dinosaur skeleton replications and dinosaur figures. Very cool! In Natural History Island, visitors can go on a scavenger hunt as they explore the natural history of the world, from way back when dinosaurs roamed to right where we are now! 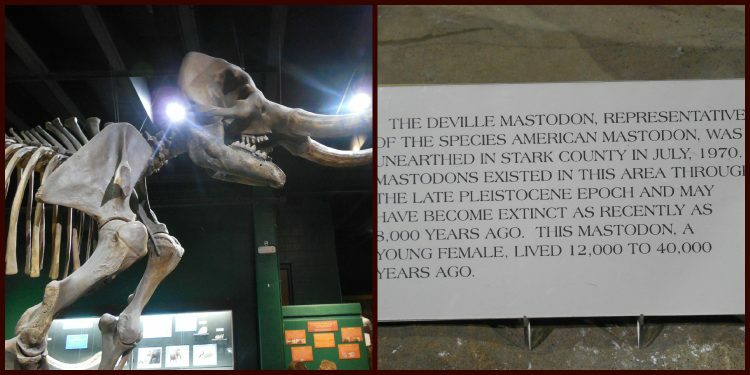 This area features an authentic mastodon skeleton, whose remains were found during excavation and construction for a local apartment building. It’s so cool to know that dinosaurs really roamed this area! Skeleton of a sabertooth tiger found in the La Brea Tar Pits. Skeleton of a mastodon. See how they give information along with the features? Very good for educational purposes! 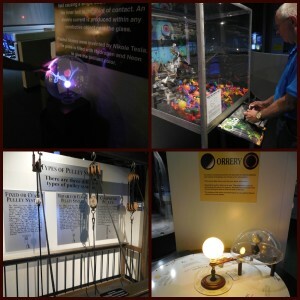 Some of the fun interactive activities at Natural History Island. Go on a scavenger hunt, sort through rocks, and make a “fossil” rubbing! Ecology Island, housed in an imitation white oak tree, has fun interactive activities where kids can learn about the ecology systems of surrounding areas, from Nobles Pond to the Jackson Bog. A native This section of the museum hosts a collection of animals, including snakes, birds, and rodents. A replica Paleo-Indian hut is also displayed here, honoring the tribe that made Noble’s Pond home 11,000 years ago. Ecology Island teaches about the importance of eco-systems while engaging visitors in hands-on activities. 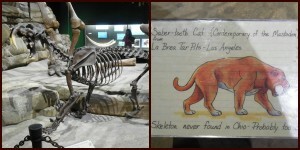 A couple of the ecosystems featured at the museum. These are based on local parks and nature preserves. Kids can learn about bees in Ecology Island. They can even watch the bees work the hive (center photo)! Ecology Islands features many living creatures, from rodents to birds to reptiles. In Space Station Earth, visitors get the chance to examine popular experiments and find out how and why things work. There are robotics, experiments demonstrating the different types of power, a shadow-catcher, and even a car built by a team from my school, Stark State College! My family found great entertainment in the green screen that allows visitors to pretend to be meteorologists and news reporters. Some of the awesome experiments guests get to interact with in Space Station Earth include robotics, power generators, and a pulley system! An example of the learning opportunities guests get to encounter at Space Station Earth. The green screen and computers allow visitors to pretend to be weather forecasters. I think we did a pretty good job! The Hoover-Price Planetarium is an awesome feature of the McKinley Museum. This planetarium enables visitors to experience the excitement of outer space by using over 60 projectors to show meteor showers, asteroids, constellations, phases of the moon and more! Showings during the week are reservation-only, but on the weekends public shows are held Saturday at 1:00 pm and Sunday at 2:00 pm. In the Stark County Story section of the McKinley Museum, visitors get to learn the history about William McKinley’s home county. Over 200 years of history are preserved in photos, audio, and other memorabilia. 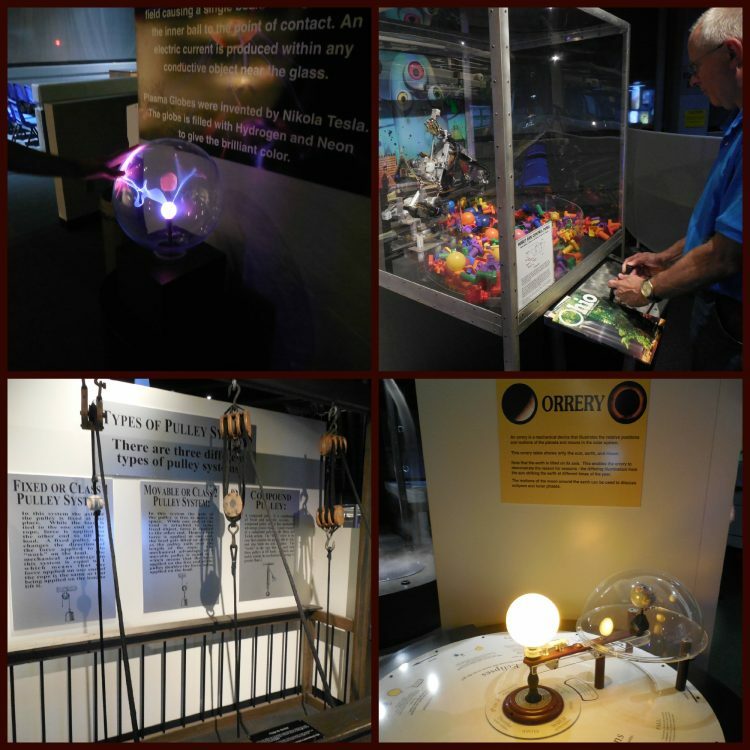 The display includes visual and interactive displays. Have you ever thought of riding a sweeper? The Hoover Company, based in Ohio, has an awesome sweeper-powered chair on display and visitors can ride in it! Another local company, Timken, which produces ball bearings and other industrial parts has a ride which lets guests spin around in a giant Timken bearing. 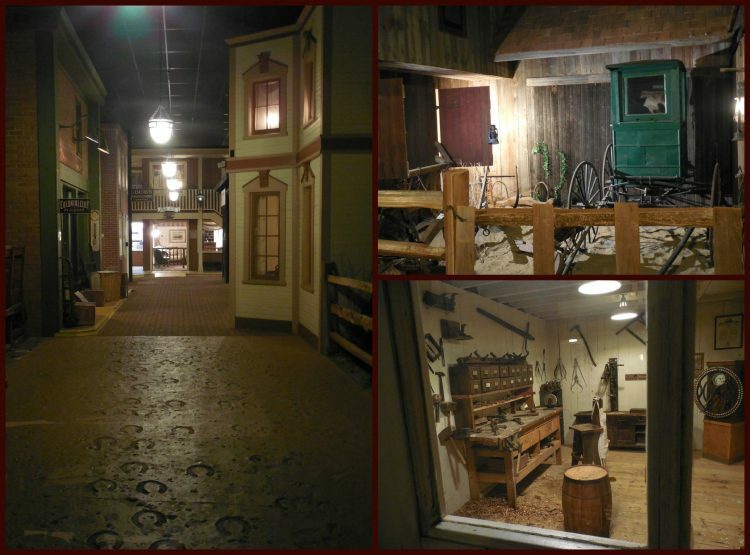 There’s plenty to see and learn about at the Stark County Story exhibit. Check out this old bed and the “founders of Stark County” plaque! Some old pieces from way back when featured in the Stark County Story exhibit. War memorabilia related to Stark County. What do you know about the Underground Railroad? I live a couple blocks down from part of it! One of the most fascinating features of the museum – a sweeper-powered chair! Out of all the exhibits of the McKinley Museum, I believe that the Street of Shops is the most unique. There’s an entire town inside the museum building. Visitors can walk the streets of a time way back when, listen as the townsfolk go about their daily lives, see how people lived, and listen to narrators tell stories about the town. Some of the fun things you’ll see/encounter at the Street of Shops exhibit. 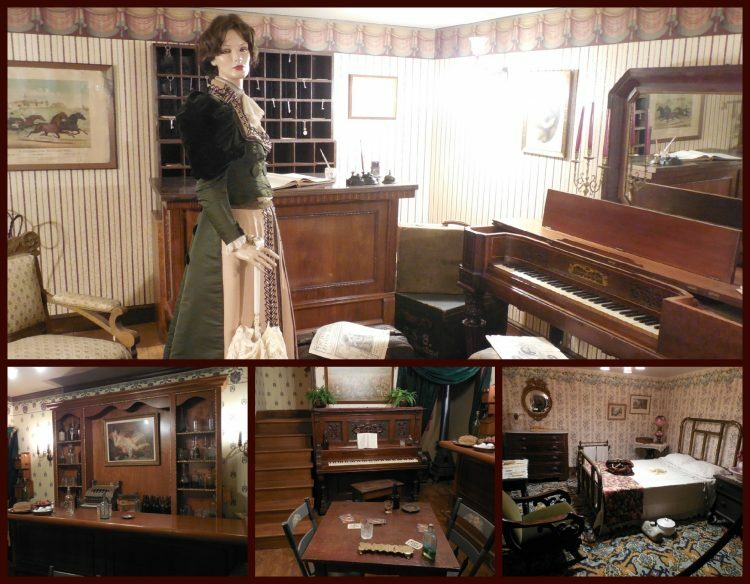 In the Street of Shops exhibit of the McKinley Museum, you can visit the dentist’s office, or check in at the hotel, or stop by the general store to pick up your mail. You can do all of these things and so much more. Visit the doctor, the pharmacy, and/or the dentist at the Street of Shops! Check in at the hotel and stop by the bar during your tour. This Street of Shops is definitely suited for all ages – there are fun things for kids to explore and interesting things for adults to experience. 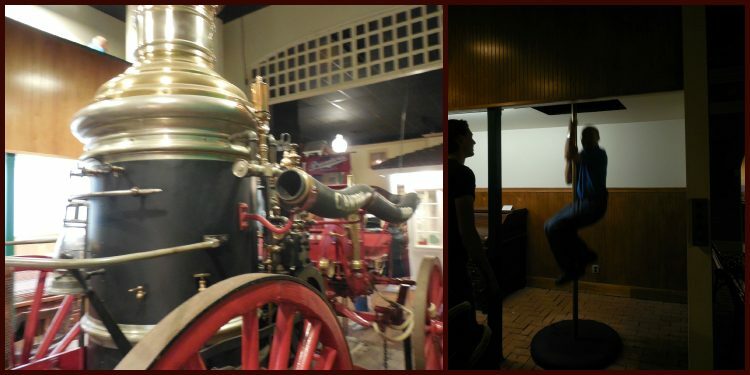 This was my grandparents’ favorite section of the McKinley Museum – my grandpa even slid down the fire pole! 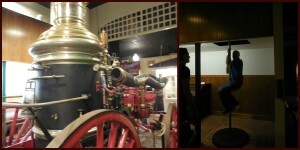 An old firetruck at the fire station and my grandpa sliding down the fire pole! As I said, I used to come to the McKinley Museum on field trips when I was growing up. It is such a great place and a big part of my childhood. I highly encourage you to bring your children so that they, too, can have this experience (and so you can, too!) Even if you don’t homeschool your kids, it’s a great place to visit: there’s no such thing as getting too much of an education! Tickets for adults cost $9, $8 for seniors (60+), and $7 for children between the ages of 3 and 18. Children 2 and under are free. 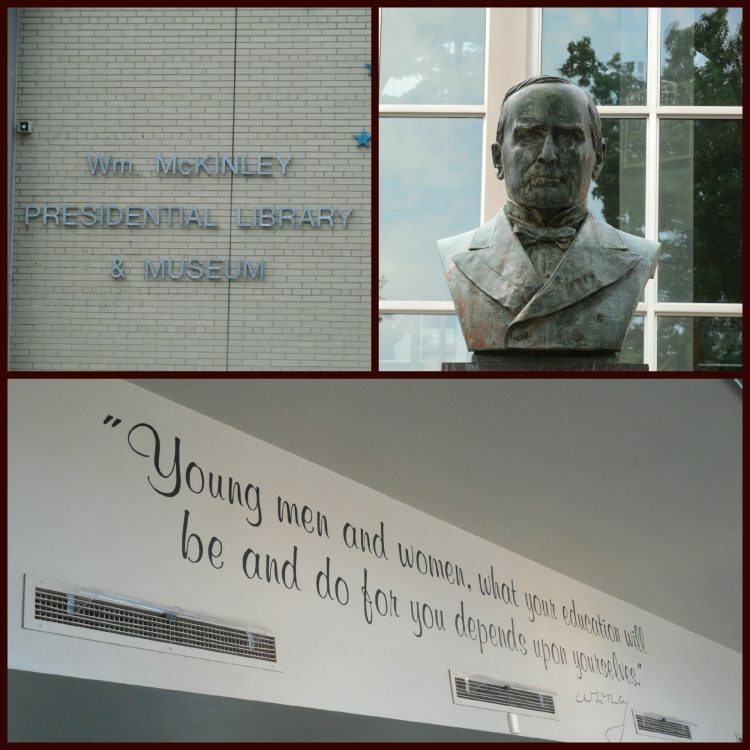 The McKinley Presidential Library and Museum is open Monday-Saturday 9:00 am – 4:00 pm, and Sunday noon to 4:00 pm. 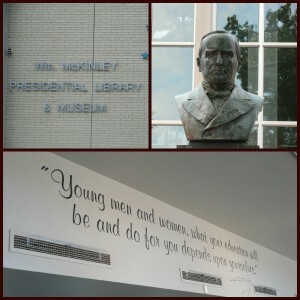 You can visit the website here for more information on the McKinley Museum. I think Iam related to President Mckinley but am havjing a hard time find if I really am can you help me?